In July 2016 the President of the Russian Federation Vladimir Putin signed a law to ban the cultivation and breeding of genetically modified plants and animals (GMO), except in cases where they will be used in testing and scientific research. In fact, this law makes Russia the world’s largest GMO-free territory and offers a great platform for the development of organic agriculture. This decision made by the Russian government was also influenced by environmental organizations, farmers and other representatives of Russian society, concerned by the absence of reliable scientific studies on the long-term (‘long-term’ comes here with an emphasis) risks of GMO food to human health and the environment. The Kremlin has also apparently taken into consideration the interests of national food security, as the world market of genetically modified (GM) seeds is monopolized by transnational, mostly American, German and Swiss based companies. Many European Union countries, unlike the U.S., have already applied restrictions on GMOs, similar to the ones implemented now in the Russian Federation. Only five EU countries (Spain, Portugal, Czech Republic, Slovakia and Romania) have been cultivating GM crops, but even they have begun to decrease the area of GM crop cultivation gradually. The U.S., represented by its biotechnology corporations, has been trying to conquer the EU agricultural sector and to make it a part of the GMO global market. This agricultural misalliance would be officially named Transatlantic trade and investment partnership (TTIP), and the mass media has already named it ‘economic NATO’. It’s interesting to note that the GMO question appears to be one of the main bones of contention in the negotiation process around TTIP. 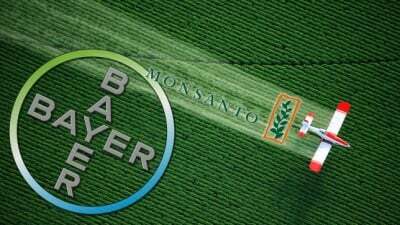 Amidst this discussion in the middle of September 2016 it was announced that German chemical & pharmaceutical giant Bayer agreed to buy US seeds and pesticides corporation Monsanto in a $66 billion takeover deal. If the sides finalize the agreement (which is to be signed by the end of 2017) and regulatory authorities in USA and EU approve it, it will create a ‘transatlantic monster’, the likes of which the world has never seen before. The new company will to a great extent dictate to the whole world what to eat, what medicine to take and how to run agriculture. Let’s try to find out what is behind this news and what it means for Russia, Europe and for everyone worldwide. To begin with a few words about the principal characters in this play – the companies Bayer and Monsanto. The Bayer company was founded in 1863. It was mainly known for marketing heroin as cough suppressant and aspirin. Nowadays the company produces a wide range of agrochemical, pharmaceutical and medical products and one of its branches carries out studies in the field of genetic engineering (Bayer CropScience). The historical connection between Bayer and the ‘death industry’ is however not so well-known: it was a manufacturer of chemical weapons for the German government during World Wars I and II. We know as well very little about almost hundred years of ‘special relationships’ with the U.S.. According to distinguished historian, the Stanford University professor Anthony C. Sutton, the I. G. Farben cartel (Interessen-Gemeinschaft Farbenindustie AG) was formed in 1925 by Herman Shmitz out of six already giant German chemical companies, including Bayer, with Wall Street financial assistance. “Twenty years later the same Hermann Schmitz was put on trial at Nuremburg for war crimes committed by the I.G. cartel… but the American affiliates of I.G. Farben and the American directors of I.G. itself were quietly forgotten; the truth was buried in the archives… Without the capital supplied by Wall Street, there would have been no I.G. Farben in the first place and almost certainly no Adolf Hitler and World War II”, Sutton wrote in his book ‘Wall Street and the Rise of Hitler’. In the post-war period the ‘scientific’ potential of Bayer was again in demand – but this time the Nazis were replaced by NATO generals. The connections of Bayer with the western military-industrial complex in fact never ceased. The second participant in the ‘deal of the year’ – U.S. company Monsanto – is famous today mostly for its achievement in the fields of genetic modification of seeds and production of pesticides for GM crops. However, like Bayer, shortly after its foundation in 1901, Monsanto became deeply involved in purely military projects. In its Dayton laboratory in Ohio, as a part of the Manhattan project, the first polonium-based neutron initiators were constructed. They were used in the atomic bombs, which the USA dropped on Hiroshima and Nagasaki (leaving more than 200 thousand dead). During the Vietnam War Monsanto was the largest supplier of Agent Orange for the U.S. army. It was used as chemical weapon (nearly 3 million people were affected, half a million were killed). In other words, Bayer and Monsanto should be considered as very unusual companies. They are not only the largest representatives of the chemical and biotechnological industries of the Old and the New World, but, in some ways, they also fully represent their military-industry group. That is why the deal in question must not only be studied from the economic point of view, but also assessed as a geopolitical issue reflecting the current balance of power between the USA and EU. To my mind, it is not that much about a take-over, it’s a merger between Bayer-Monsanto, and it creates a new transnational structure. If this was not the case, the influence of the EU in the relationship between Washington and Brussels would grow significantly, but it is completely different in reality. Moreover, taking into consideration the importance of the GMO factor in U.S. foreign policy, it is difficult to imagine that the White House would let this huge assets flow into anybody’s hands, certainly not into the hands of the Germans. Apparently, the merger of these two giants is part of a backstage U.S.-EU agreement and trade-offs within the TTIP negotiations process. Brussels, in exchange for a ‘back-down’ on some disputable issues, has gained an extra share in the global biotechnology industry. Monsanto, on the other hand, by re-branding a U.S.-company to a European one, expects to open the E.U. market for its GM production. Let me remind you that the first $ 62 billion offer, made by Bayer in May 2016, was declined by Monsanto. However, after loud statements made by leaders of Germany and France in August, saying that the negotiations on TTIP actually had failed, the parties ‘suddenly’ reached a consensus. It is obvious that the parties had a ‘package deal’, and it was agreed on a state-to-state level. If this is the case, the progress in Bayer-Monsanto merger deal will be followed by progress in the TTIP negotiations. For European citizens, the vast majority of whom, just like the Russian people, have taken a stand against the spread of GMO agriculture, such a ‘package deal’ would be a betrayal of public interests by the European bureaucracy machine. The fall of Europe as one of the few ‘green bastions’ in the world under the pressure of U.S. corporations would mean trouble for Russia too. ‘Genetically modified NATO’ has been moving closer to our borders, threatening our biological, genetic and food security. We want to believe that one day, in some miracle, corrupted European bureaucrats will be replaced by nationally oriented leaders. It is possible then, if it is not too late, we will form a ‘green axis’ Paris-Berlin-Moscow and through our joint efforts expand the borders of the continental GMO-free zone. That would allow us to protect the traditions of agriculture in the Old World, to develop organic agriculture and to reform the world economy according to the principles of sustainable development. But can Europeans afford to wait for a miracle? Or is it high time to act?